Brian Lim got into gloving by accident. 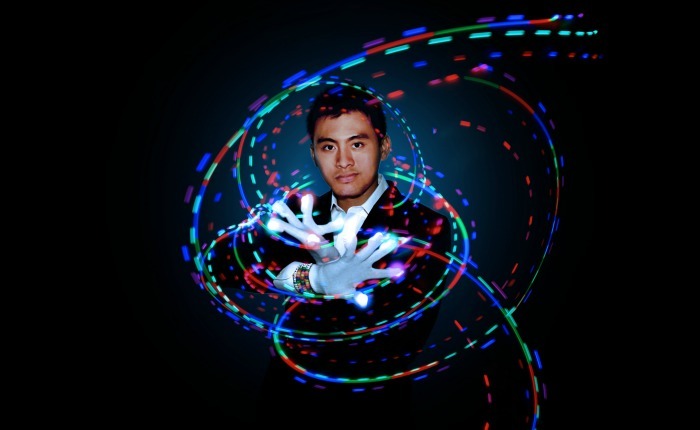 Around 2010, while at the Los Angeles club Avalon, Lim’s girlfriend (now his fiancé) put a pair of light-up gloves on him for the first time, and he proceeded to give a makeshift light performance for a few people in the crowd. He found that he not only enjoyed what he was doing, but that he was good at it. Lim found, however, that there was no real community around gloving, and that the products at the time were less than dazzling. He thus started an event called Friday Night Lights, for which he invited fellow enthusiasts to an In ‘n Out parking lot in the L.A. suburb of Baldwin Park. Here, he bumped music and sold products out of his trunk. He had to relocate to different parking lots each week, as the crowd grew from 20 to 50 to 100 and up. In time, Lim founded EmazingLights, which sells gloving products online and at five stores in SoCal, Texas, Florida, Colorado and Canada. (Lim is also the founder and CEO of festival fashion company iHeartRaves.) While gloving is not allowed at Insomniac events, the culture thrives in clubs, live sets and at gloving-specific tournaments, including the BOSS Gloving Competition, which EmazingLights hosts this Saturday, May 16 in West Covina, CA. Based on social media reach, Lim estimates there are currently 150,000 glovers around the world. Gloving and light shows are so specific to the world of electronic music. Where did the activity come from? Gloving really originated at Insomniac festivals. The ban was a bummer, but what it really did was motivate me to showcase gloving as a legitimate art form. I wasn’t happy with how gloving was portrayed and seen by the public. Being a glover and seeing all the talent in the scene—these kids are practicing every single day for hours and creating real art, but it’s not seen that way. Do you think gloving was banned because of its association with drugs? I decided to create the International Gloving Championship, which showcases gloving as a sport. We have judges, and they judge on creativity, musicality, flow—things that make a good light show. We have hundreds of competitors, judges and sponsors, and it really shows that gloving is a lot more than people waving their hands around. What differentiates a good glover from a great glover? It’s kind of like asking what makes a good dancer versus a great dancer. I think what people really do respect is musicality and being able to freestyle. Because gloving was really born out of the festival scene, you really don’t know what songs the DJ is going to play. Being able to adapt to what the DJ is playing and be on beat—while controlling your colors and flashing patterns—that really differentiates glovers. Is there a musical genre that’s optimal to glove to, or is it a personal preference? It’s definitely a personal preference. EDM is definitely the dominant genre of music for glovers, but it’s spread over to trap. Trap is super popular. No matter what, you’ve gotta move to the beat. You’ve gotta interpret the music and showcase it with your movements. What elements go into a performance? The interesting thing about gloving is that it’s a real one-on-one experience. It’s really the glover giving his full, undivided attention to one or several people for two to three minutes. They don’t repeat moves—otherwise they’ll lose that attention. Being unique, timing that to the music, controlling your colors, your flashing patter, clicking each light individually—there’s a lot running through the mind of a glover. Yeah, that’s definitely one of the things that sets gloving apart from a lot of other art forms like poi performances, which usually happen on a stage for a large group of people. As a glover, you’re really giving your all to this one person right in front of you and reading their reactions and what they like—kind of like how a DJ has to feel the crowd and adjust the set. Do you actually hypnotize people? Oh, absolutely. There are different styles of gloving, of course, but some styles are really up-close and personal. There are also styles that are farther away, with full arm-cutting or finger-cutting, so you can see the actual movements. Impacting is another style of gloving that’s really up-close in their face and involves a lot of light manipulation. Are you also dancing while you glove? It’s interesting, because gloving has really evolved. Today there is a lot of full-dance gloving going on. It was featured on the MTV show America’s Best New Dance Crew last season. The last three crews left had to glove, and they were doing full-body dancing incorporating gloving. What was it like seeing your sport break into the mainstream like that? It was an awesome experience. They had invited us to work with those crews for a month and a half. At first, we were really flattered that some of the world’s best dancers were going to try gloving for the first time. We were like, “These guys are going to pick this up so easily.” It was crazy, though, because they were admiring what our glovers were doing because they had so much finger control. None of the professionals could keep up. Tell me more about your event this weekend. It’s a derivative of IGC, which is the Super Bowl of gloving that happens every year. BOSS is the local competition that we host in our stores across the US. We have five stores right now, and these competitions are qualifiers for people to get into IGC, which happens at the Yost Theatre in Santa Ana. There are about 500 glovers, 50 judges, and spectators. It’s… also kind of a light and arts convention. What’s the newest technology in gloving? It’s called the eLite Element. They’re gloves that came out just last week. It has accelerometer technology, so it’s motion activated and knows when you’re going slow or fast and automatically changes your color and flashing patterns. In the past, people would have to change every single finger to change their modes while they were giving the show. That’s like the difference between DJing on vinyl and DJing with a USB. Yes, it gives you the ability to change automatically, but you still have to have speed control to utilize it correctly. It’s really an addition; it doesn’t make it that you press a button and you’re done.